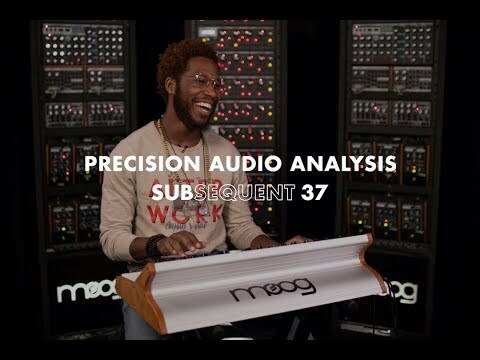 The Moog Subsequent 37 Paraphonic Analogue Synthesizer, takes its sound engine directly from the acclaimed Sub Phatty and comes with a raft of new and updated features that Moog has carefully developed. These new features include a programmable Arpeggiator/Step-Sequencer, Duo Mode, two modulation busses with user-assignable source and destination options, direct access to 256 presets, and a 37-note velocity sensitive keyboard with aftertouch. The Subsequent 37 comes with a fully featured and programmable Arpeggiator and Step-sequencer, with all the controls laid out in a readily accessible panel. Classic arpeggiator modes can be easily dialled in, switched on, and with expressive controls at your fingertips, you can attenuate the level of smoothness or crunch to your heart's content. Switching over to sequencer mode is as simple as pushing a button. Hit record, play a pattern on the keys and then push play to hear it back. You can transpose recorded passages on the fly, as well as make tonal adjustments using the array of Modulation Busses, Oscillators, Filters and Envelope Generators on offer. The 16 quick select sequencer buttons can be used to access the 256 built-in presets, that's 16 banks x 16 presets, with 128 factory presets and 128 user presets for you to fill with your own sounds. One of the latest features of the Subsequent 37 is Duo Mode, which allows Oscillator's 1 and 2 to be played independently. This opens is a world of opportunities for you to explore. The Glide section allows you to assign the effect to Osc 1 and 2 independently, to set up a two-part sound with both a driving bass sound and a smoother lead sound; both Osc 1 and 2 can be synced to ensure that sweeps, filters, etc., will stay perfectly in time, allowing you to make your sound as simple or complex as you wish. By taking advantage of the aftertouch feature on the keyboard, you can use this a controller to feed into either of the modulation busses, giving you incredible hands-on touch control over mod settings. Taken from the Sub Phatty are the powerful DAHDSR (Delay, Attack, Hold, Decay, Sustain, Release) looping envelopes with panel control for each. As well as featuring the Classic Moog ladder filter circuit - with resonance, MultiDrive, and selectable filter slopes that deliver creamy and warm analogue tones -, the team behind the Subsequent 37 have played around with the gain staging, drive and distortion to take your sonic palette to another level. The mixer section includes a new Feedback control that takes the sum of all the sound sources going through the synth, which can be fed back into the Subsequent 37 via the external audio input. This allows you to go from smooth overdrive to heavily distorted for devastating effects. For studio or stage, the Moog Subsequent 37 Paraphonic Analogue Synthesizer is a performance dream and gives you 100% analog signal with cutting edge control. Programmable Destinations Filter Resonance, Filter Drive, Filter Slope, Filter Env Amount, Filter Keyboard Amount, Osc 1 Level, Sub Osc Level, Osc 2 Level, External In/Feedback Level, Osc 1 On, Sub Osc On, Osc 2 On, Noise On, External In/Feedback On, Arp Rate, Arp Clock Division, Arp Range, Arp Back/Forth, Arp Ends, Arp Invert, Arp Gate Length, Arp Run, Glide Time, Glide OSC Choice, Glide Type, Glide Gate, Glide Legato, Glide On, LFO 1 Clock Division, LFO 1 Range, LFO 1 Sync, LFO 1 Keyboard Reset, LFO 1 Keyboard Track, Mod 1 Pitch Amount, Mod 1 Filter Amount, Mod 1 Programmable Amount, Mod 1 Programmable Destination, LFO 2 Clock Division, LFO 2 Range, LFO 2 Sync, LFO 2 Keyboard Reset, LFO 2 Keyboard Track, Mod 2 Pitch Amount, Mod 2 Filter Amount, Mod 2 Programmable Amount, Mod 2 Programmable Destination, Osc 1 Oct, Osc 2 Sync, Osc 2 Keyboard Reset, Osc 2 Oct, Osc 2 Keyboard Control, Osc 2 DUO Mode, Osc 2 Freq, Osc 2 Beat Freq, Filter Env Attack, Filter Env Decay, Filter Env Sus, Filter Env Release, Filter Env Delay, Filter Env Hold, Filter Env Vel Amount, Filter Keyboard Track, Filter Env Multitriggering, Filter Env Reset, Filter Env Sync, Filter Env Loop, Filter Env Latch, Amp Env Attack, Amp Env Decay, Amp Env Sus, Amp Env Release, Amp Env Delay, Amp Env Hold, Amp Env Vel Amount, Amp Keyboard Track, Amp Env Multitriggering, Amp Env Reset, Amp Env Sync, Amp Env Loop, Amp Env Latch, Output Volume, Bend Up, and Bend Down.